Welcome to essayright.com. Thank you for choosing essayRight for your editing and proofreading needs.This User Agreement (the "Agreement") is between you ("the Customer") and essayRight. essayRight reserves the right to change these Terms & Conditions at any time. BY USING THE SERVICE IN ANY WAY, THE CUSTOMER UNCONDITIONALLY ACCEPTS THE TERMS AND CONDITIONS CONTAINED WITHIN THIS AGREEMENT. IF THE CUSTOMER OBJECTS OR DOES NOT OTHERWISE WISH TO BE BOUND BY THIS AGREEMENT, THE CUSTOMER MAY NOT USE THE SERVICE. Therefore, before using the Service, the Customer should carefully read this Agreement. A. "Communication" is any notice, record, agreement, or other type of information made available to the Customer or received from the Customer in connection with the Service. B. The "Contract for Services" will consist of the terms of this Agreement, and is not limited to, the Payment Options, Due Date, Project Fee and Remainder Due, as well as any modifications, conditions, or special instructions provided by the Customer. The effective date for the Contract for Services shall be the date and time upon which the Customer makes full payment to the Company. Any modifications with the service should be included in the Second Round of Editing. All documents received and edited by essayRight are stored in a password protected folder. This is to ensure security and privacy of the clients and the documents. Unless specified otherwise by the author, they will be saved for a period of one year before being deleted. When a customer visits essayRight.com or sends e-mails to us, he or she is communicating with us electronically. essayRight communicates with the customer by e-mail or by posting notices on this site. The customer agrees that all agreements, notices, disclosures, and other communications that we provide to you electronically satisfy any requirement that such communications be in writing. The Customer agrees that the email address provided by him/her will be a valid email address that the Customer uses and checks regularly. This email address should be the designated email address which the Customer anticipates using for the sending and receiving of any and all emails to and from essayRight. Examples of the types of emails that may be sent by essayRight includes, but are not limited to, the confirmation of the Customer’s submission, invoices, receipts for the Customer’s payments, and the notification that the editing and proofreading work on the Customer’s document has been completed and is ready to return to the Customer, as well as other notifications, answers to questions, or other Communication regarding the Customer’s project or the Service. The Customer acknowledges and agrees that it is the Customer’s responsibility to check the Customer’s email, including the "SPAM" folder (or any other folder that filters emails), in anticipation of these emails. Further, the Customer acknowledges and agrees that it is the Customer’s responsibility to notify essayRight in the event the Customer does not receive an anticipated email as soon as the Customer is aware that the Customer has not received the anticipated email. The Customer should note that the confirmation email will be sent immediately to the Customer’s provided email address upon submission of the Place Your Order. By using this Service, the Customer accepts responsibility for all documents, materials, or information the Customer sends, communicates transmits or submits, or that the Customer authorizes a third party to send, communicate transmit or submit, to essayRight. These material includes, but is not limited to, letters, emails, documents, presentations, or any electronic files of any kind. Authors submitting material to the Company for services retain copyright in such material. essayRight does not claim any rights to such material by virtue of supplying its services, and will not use or disclose the materials for any reason other than providing its services. The customer represents and warrants that she or he owns or otherwise control all of the rights to the material submitted for services and that said material does not violate or infringe upon any copyright or other right of any third party. essayRight may deny or refuse service to any customer or prospective customer for any reason without explanation. essayRight takes no responsibility and assumes no liability for any material submitted by the customer or any third party. The customer is responsible for providing true and accurate information with respect to his/her name, address, phone number, email address and all payment details. Failure to provide correct and accurate information can result in a refusal to provide service. The customer is responsible and liable for all problems, errors and issues resulting from any false information provided to essayRight. All information the customer submits to essayRight is confidential and secure. The customer is advised that plagiarism and breach of copyright are serious offences and essayRight assumes no responsibility for such content. The customer is advised that plagiarism and academic evaluation of student work depends on considerations beyond our control. Therefore, we cannot be held legally or otherwise responsible for disappointing and/or unsatisfactory outcomes of any factor, including the negligence of editors, staff, or claims of such negligence. essayRight will not proofread and edit work in a way that infringes on potential plagiarism guidelines established by the academic community; this includes, but is not limited to, rewriting substantial amounts of text, rewording copied (not cited) text from others, adding substantial text to your paper (including incomplete sources in your references list/bibliography), paraphrasing any part of other people's work, and checking your paper for plagiarism. The Customer is advised that the customer has the full authority and responsibility over the content of the documents, materials, or information the Customer sends. 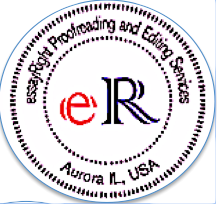 essayright is legally or otherwise not responsible for the subject of the customer's content or the purpose behind the writing of the essay or paper either in it's published or unpublished version. Any outcome from the customer's written content, either positive or negative, published or unpublished, is the sole responsibility of the customer. essayRight is only responsible for the services essayright has undertaken in response to the request made by the Customer. essayRight's services do not include adding content or removing content, regardless of the nature of the content. The Customer agrees to use the Place Your Order Form located at http://www.essayright.com/ as per the instructions on that page, for the submission of any and all documents or other files related to the Service. The Customer agrees to use the Place Your Order Form as it is presented and according to its instructions. The Customer also agrees not to change or attempt to change or manipulate the Place Your Order Form, or its intended function, in any way. Unless otherwise agreed to IN WRITING, the Customer agrees to use the Place Your Order form as per the instructions on that page, for the communication, transmission or submission of any and all documents or other files related to the Service. The Customer acknowledges and agrees that it is the Customer’s responsibility to select a reasonable and appropriate Due Date. The Customer agrees that the Customer’s choice of Due Date will provide a reasonable amount of time for essayRight to edit and proofread the Customer’s document. The Customer agrees that the Customer’s choice of Due Date will provide a reasonable amount of time for the Customer to review essayRight's work before any deadlines he or she may have related to the project. If, essayRight determines that it cannot have the Customer’s document edited and ready to return to the Customer by the Due Date, essayRight will notify the Customer by email. At essayRight's sole discretion, and for any reason, essayRight will, before starting work on the Customer’s project, choose to negotiate a new Due Date with the Customer, this negotiation will be performed promptly. Similarly, in the case of the Customer wishing to modify the Due date, he or she should negotiate with essayRight for such a modification. The Customer has no right to unilaterally change the Due Date of the project. The Customer acknowledges and agrees to pay the full amount when the customer receives a Paypal invoice and accepts the quote as presented in the invoice. The Customer’s submission and the auto-response email to the Customer’s submission, which will include all the information the Customer submits on the Place Your Order form, will be considered as a proposal only. This proposal will constitute an offer to enter a contractual relationship with essayRight. In other words, the Customer’s submission and the auto-response email to the Customer’s submission, by themselves, are not a promise or guarantee on the part of essayRight to engage in any work. The Customer’s submission and the subsequent payment of charges will become a binding contract between the Customer and essayRight for the work to be done by essayRight. The Customer acknowledges and agrees that the Customer’s payment must be complete before essayRight starts any work on the Customer’s project. Authors invariably are blind to their own work. So they need an extra pair of eyes. At essayRight, every submission goes through two professional editors.